One of my very early blog posts was about online cashback schemes - I use them for pretty much every one of my online purchases and I've been a member of ICE since the very first week it was launched. ICE is a rewards scheme which offers you rewards for spending on sustainable products from retailers who make ethical and environmental commitments. ICE have a number of big names such as John Lewis and Marks and Spencer signed up to them which means you can get cashback on your everyday purchases. However, the thing that really appeals to me about ICE is the small online retailers and farm shops who really embody the environmental and ethical ideals that the ICE rewards scheme is intended to support. In the past I've bought gorgeous handmade gifts and a photo album that I hope will be a family heirloom. But this month I've been in the market for toys and games for the girls for Christmas and I was particularly looking for some wooden toys because these not only have a lower environmental impact (usually!) than much of the plastic and electronic goodies that they will also be getting this Christmas, but also because they stand the test of time. ICE have several mother and baby retailers to offer including Mimi Myne and The Little Green sheep. ICE offered me a voucher to spend and I was really impressed by the range at EthicalBabe.com who seemed to have everything I needed for Holly and her nursery, including toys! 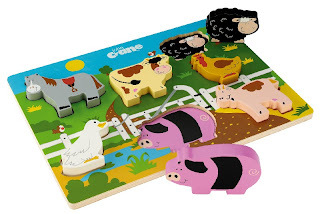 Ethical Babe had an outstanding range of organic and natural toys - I found it hard to choose. Shopping with ICE is easy. If you make your purchase with one of their retailers after clicking on the link within ICE then you will earn rewards (upto 11% in rewards at some retailers). Then, when you have enough rewards to spend, you do the same thing. When you are shopping through ICE there is a big blue bar at the top of your browser window and when you have decided what you want to buy, you click the links in the bar to say that you want to spend some of your rewards. In my case, I was given a redemption code which I then entered at the checkout of EthicalBabe.com and hey presto, my gifts were with me within the week. 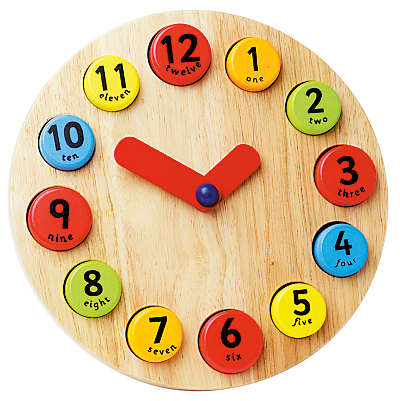 I chose a wooden teaching clock for Lara and a John Crane Tidlo wooden farmyard puzzle for Holly. They are both chunky and awesome quality and I know that they will become classics that last for years.